What is the best paper to use when printing up your resume to present in an interview? What is the best paper to use when mailing a resume as part of a job application? I guess this goes along with my post concerning the best font to use for your resume. I actually have a very specific answer to this question. For more than a decade now, we’ve been printing hard copies of people’s resumes as an add-on feature to our resume writing service. And in all that time, we’ve used the same paper. I’ll tell you all about it, but first, let me make clear: I’m not getting paid or receiving any other consideration for the endorsement I’m about to make. 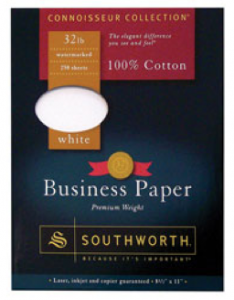 Having said that, in the resume writing industry, Southworth is the only paper brand most of us use. You can find a wide range of Southworth paper products at most of the “big box” office supply retailers like Staples or Office Depot. The specific type of paper I recommend using is Southworth Business Paper, 32lb, 100% Cotton, 8 1/2″x11″ and WHITE. It’s simply the best paper. It’s thick and hearty enough to feel and look professional, but it’s still easily used in most printers. The paper is clear and the texture makes the text legible. 24lb paper is “ok” in my opinion, but a little on the light side. It feels too much like high quality laser printer paper. I prefer something that feels higher class. And 32lb does that. Southworth sells paper that they specifically brand as “resume paper” but I prefer the business paper just because of the look and feel. You’ll do fine with the resume paper, but aim for 32 lb if you can. I don’t like the linen paper. It’s too grainy and a bit to “showy” for me. The cotton paper has the heft and the texture without the visible grain. I always and only recommend going with white paper. The ivory is too much like a college diploma, and to me that reads as a bit to formal. At ResumeWriters.com, we buy paper by the boxful, but if you look around, or order online, you can get the paper I’m describing in smaller boxes of a few dozen sheets. You WILL have to pay more, but you’re paying for quality. If you’re paying for this sort of paper, you owe it to yourself to print your resume using a laser printer. Trust me, it will just look better. It’s the little touches that count the most. So many job seekers think that sending a resume via email somehow precludes the need for a nice hard copy. Presentation is EVERYTHING. Handing a nicely printed resume on good resume paper to the person interviewing you is absolutely essential! Might want to make sure to proofread what you put on that great paper — change to “too showy” and “too formal”. — I don’t like the linen paper. It’s too grainy and a bit to “showy” for me. The cotton paper has the heft and the texture without the visible grain. — I always and only recommend going with white paper. The ivory is too much like a college diploma, and to me that reads as a bit to formal.